Building mixed reality (AR/MR) experiences where real and virtual objects are blended together. Displaying passthrough AR experiences in an Oculus Rift or HTC Vive. Capturing VR applications from a third-person point of view in front of a green screen. 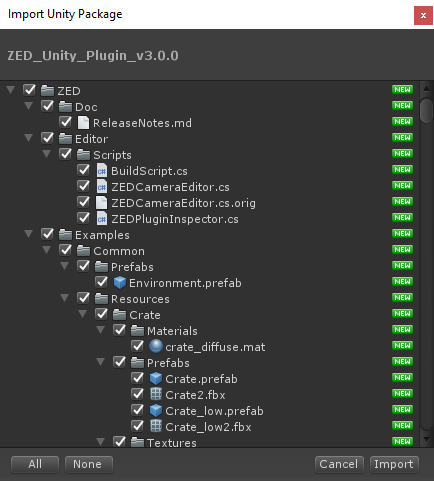 The ZED Plugin for Unity is available as a Unity package. It includes assets, scripts, and sample scenes to assist with development. Many of its core features, such as mixed reality, take minutes to implement thanks to its prefabs. Editor: Contains scripts to add functionality to the Unity editor interface. Examples: Contains sample scenes illustrating how to use the plugin. Prefabs: Contains the main prefabs to add ZED camera to a scene: ZED_Rig_Mono and ZED_Rig_Stereo. SDK: Contains files and resources to interface the ZED SDK with Unity. Unity 5.6.X or higher. Prefabs may not work with earlier versions. Copyright © 2018 Stereolabs Inc.